Chinese technology giant Baidu says it has achieved volume production of small driverless buses that will be on the road in Japan next year. By rolling out its 14-passenger Apolong self-driving buses for both domestic use and export, Baidu is making progress on what may be the first type of autonomous vehicle that is widely used. The announcement last week, at the Baidu Create 2018 show in Beijing, also marks an advance by China in the international AV race. Baidu announced it has produced 100 of the vehicles, which it developed with bus manufacturer King Long, at a factory in Xiamen in south-eastern China. The Apolong is a Level 4 AV, meaning it can perform all driving functions under certain conditions. It can swerve and avoid obstacles on its own, among other things, Baidu claims. Initially, the buses will be deployed for last-mile connections at airports, tourist destinations and other enclosed areas. Apolongs will be commercially deployed in Chinese cities including Beijing, Shenzhen, Wuhan and Xiong’an, a “smart city” development hub about 100 miles south of Beijing, the company said. They will also hit the road in Japanese cities, including Tokyo, early next year through a partnership with SB Drive, the AV division of Japan’s SoftBank Group. Buses are shaping up as one of the early commercial applications of self-driving technology. They’re built for one purpose and travel on designated routes or in specific areas, so the daily driving challenges they face can be more manageable than for general-purpose cars. A fleet of autonomous buses in Detroit began shuttling workers between office buildings and parking lots last week, beginning on a one-mile loop with plans to serve the whole central business district. The shuttles, developed by Michigan-based May Mobility, go 25mph and connect to roadside cameras that help them read traffic lights. Baidu’s buses run its Apollo self-driving software, which includes perception, mapping, planning, control and other components. The company calls Apollo an open platform and counts Ford, Honda, Intel, Microsoft and Mercedes parent Daimler among its 116 partners. 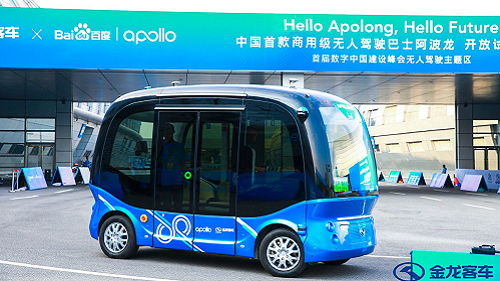 At Baidu Create, the company introduced Apollo 3.0, which it said has capabilities for autonomous minibuses, microcars and valet parking. Baidu is often considered the main Chinese rival to US companies like Google (and spin-off Waymo) for world leadership in AVs. Both Baidu and Google started in the web search business and have huge markets in their home countries. And while China’s domestic market is a hot destination for AVs and general automotive growth (Daimler last week became the first foreign company to test Level 4 AVs there) the country’s big self-driving players are also expanding overseas. Baidu already has research facilities in Silicon Valley. The US division of another Chinese AV and ride-hailing company, Didi Chuxing, opened a lab there last year and received a permit to test self-driving cars in California in May. Meanwhile, Google has been largely absent from China since 2010, when it pulled out of the country over censorship and hacking. The US-China trade war launched last week is likely to ratchet up the rivalry even further and may make it harder for US companies to make inroads there. — Stephen Lawson is a freelance writer based in San Francisco. Follow him on Twitter @sdlawsonmedia.